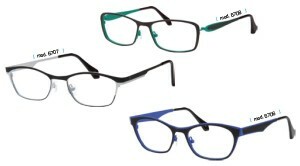 Plan “B” Eyewear adds new spring models to its Glacée line. The newest models are all about colour and shape, keeping designs simple and feminine. The 6706 model includes gorgeous dark blue, light pink and classic black and white options. Interplay between light and dark colours with high-end matte finishes give these frames a classic look with a bold twist. The 6707 is a slim frame that creates bold brow dimension through precise colour application. The 6708 frame is the most playful amongst the new models, featuring an interesting eye shape and perforated temples that allow hints of bright spring colour, like green or coral, to peep through. High quality materials and stunning colour applications continue to define Glacée, and this release is no exception.